Amy bought several of my flower-pattern eggs. With an eye to theoretical marketing, I needed to replace them. The slightly less enlightened self-interest answer is: this is one of three eggs I did at an egg workshop we had at her house, I figured she'd be most interested in seeing how eggs like hers were made. 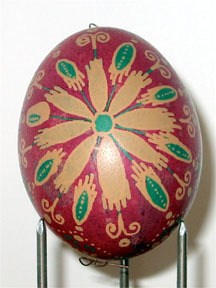 This shell was weak enough that the earlier green dye colors sweated through into the egg. One of the big aggravations of this art is not ever knowing if your shell is as good as it looks, or which dye it will really like best. When I removed the little wax plugs from the holes in the egg, a sickly purple color bled out, marking up the egg design, but, for all I know, you wouldn't see it if I hadn't pointed it out. And maybe it only looked bad because it wasn't part of my plan. A way to avoid this doing too much damage is to leave the wax on, except to remove the plug over the biggest hole, and position the eggs so that this is the lowest point and then leave the egg alone until it is dry. 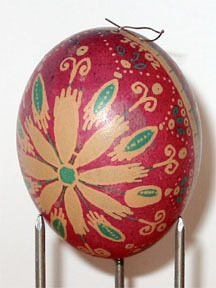 If the final color is still too discolored for your liking, you can replug the hole and dip the egg again.